If you use water-based paints, rinse paint brushes in the sink. If you use oil-based paints, you can filter and reuse the thinner used to clean brushes. Dispose of thinner through a local household hazardous waste program. 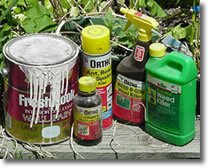 Visit www.state.nj.us/dep/dshw/rrtp/hhwcps.htm for a list of local household hazardous waste facilities. Sweep up dirt and debris and discard on your lawn or in the trash. Hosing off pavement washes pollutants into storm drains, which may lead to local creeks, bays and the ocean. Rather than wash your car in your driveway, on the street or in your yard, take it to a local car wash. This not only conserves water but also eliminates the running off of harmful pollutants. Keep trash cans closed to prevent trash from scattering. If you use hazardous substances such as paints, solvents and cleaners, use them sparingly, according to the directions. Store properly to avoid spills. If you are working on a home improvement project, dispose of drywall and hardened concrete and mortar in the trash or visit www.nj.gov/dep/dshw/lrm/classb.htm for a list of recycling centers. Do not rinse concrete or mortar from a bucket or wheelbarrow into the street; dilute the mixture with water and rinse it into an area with vegetation or gravel. Participate in local recycling programs. To find out more about recycling in your area, visit www.state.nj.us/dep/dshw/recycling/index.htm. 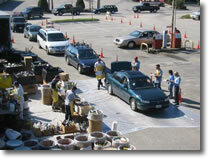 Dispose of unwanted chemicals at a household hazardous waste collection center in your area. Never pour hazardous materials into the street, sewer or the storm drain. For more information, visit www.state.nj.us/dep/dshw/rrtp/hhwcps.htm. Eliminate or, at least, reduce the use of soaps and shampoos when using outdoor showers that drain to the street.